I’ve had sweet potato fries on my mind for the past couple days, and for two reasons. First, I bought a blue sweet potato at the local farmer’s market on Saturday morning and really wanted to cut it open to see the color (it looks like a regular orange sweet potato from the outside). The second reason is that I was told french fries are not “sophisticated” earlier this week, and I wanted to redeem the American classic in my mind. This past weekend at work, I hosted a group of 100 or so teenage boys that were visiting for three athletics-filled days. My main job was to feed them, hydrate them, and ensure that they felt at home. These boys were from all over — Oregon, Canada, New York, Arkansas. Most of them seemed perfectly fine being away from their parents for a few days, but a few didn’t seem as comfortable (such as the one who asked how he could get a new key to his room after he lost it within an hour). My job has taught me a lot about different types of people and groups, and I think I’m a pretty good judge of knowing what people need once I observe them and determine why they’re staying at the hotel. With these young men, I knew that having food they felt comfortable with (and lots of it) was going to be key to keeping them happy. For this reason, I was pretty happy with the menu that the chefs created for the group. It featured a taco bar for dinner the first night, a build-your-own deli sandwich buffet for lunch, and burgers with fries for dinner the second night. It wasn’t necessarily food that I would choose for myself, but I was certain that no complaints would be heard. Unfortunately, the teenagers did not judge the menus. On Friday morning (the day before the group arrived) the leaders of the group deemed the lunch and dinner menus “unsophisticated.” To them, tacos and french fries were not good enough food to serve to these young men. While I agree that those items are not the most refined, I laugh just thinking of the disconnect that happens between adults and kids sometimes. These boys did not care about sophistication. That doesn’t mean they were barbaric (they were actually very polite), but I knew before I even met them that I would end up having a huge mess to clean in the dining room after every meal because they would spill their food, drinks, and do other “unsophisticated” things. However, the goal is to make the client happy, and the menus were changed to include roasted chicken, spaghetti Bolognese, and tiramisu. It went over well; so well that 30 pounds of pasta disappeared within 45 minutes flat. But, I was not surprised when I received 10 room service orders later on for club sandwiches and cheeseburgers. Sophisticated, indeed. Anyway, back to fries. I don’t usually order french fries at restaurants because I would rather make my own at home in the oven. It’s so easy to do with regular white potatoes or the sweet variety. The pretty blue sweet potato gave me the perfect opportunity to fulfill my urge, plus the chance to try out a new vegetable. I hope you enjoy and revel in your unsophistication. I know I did. 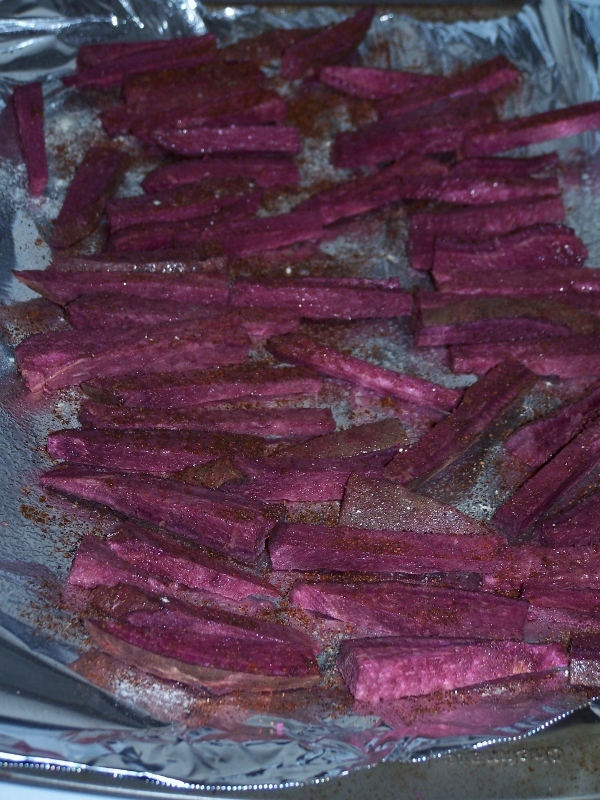 Heat oven to 400 F. Cut sweet potato in half, then cut each part in half again to creat quarters. 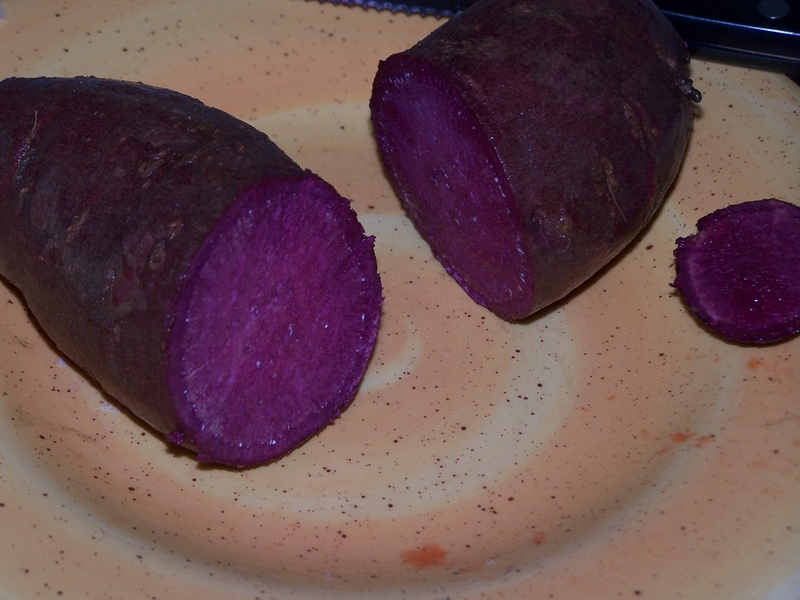 Slice potato into 1/2″ thick slices. Try to make them of uniform thickness so that they all cook equally. Cover a cookie sheet with aluminum foil and put potato slices in the center of the sheet in a pile. Pour olive oil over the slices and toss with your hands to coat. Then, spread the slices out so that none are lying on top of other pieces and add seasonings. 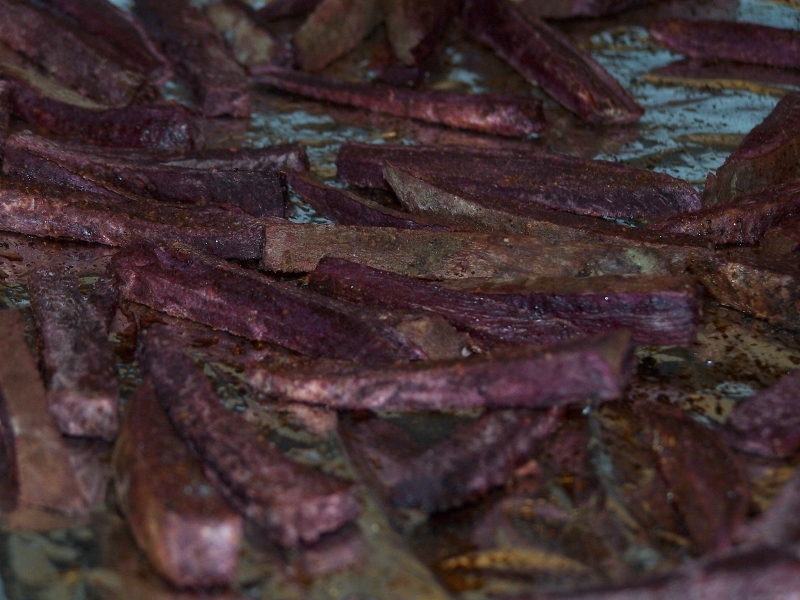 Bake for 20 to 25 minutes, turning fries once half-way through cooking. Remove, and enjoy with a nice side of ketchup! I hope you’re not sick of reading about my work. Because I’m not going to stop writing about it. Sometimes the things that happen to me at work are just so absurd that I can’t help but want to share. Take yesterday…. I get in at 6:30am to make sure that breakfast kicked off well and that meeting break areas (which include a lot of food and beverage offerings) are set up appropriately. All is well until about 8:30am when I notice one of the engineering workers at the hotel bar with his toolkit. I walk on over and discover a nice spray of water coming out of a line to the soda machine. He explains that the tube is old, but that he would patch the hole as long as I could get the water cleaned up. Not a problemwith me — my knowledge of tools is quite limited. Almost four hours pass, and I’m in the middle of lunch service for 100 meeting participants. All of a sudden, one of my dining room servers frantically runs over from behind the bar and tells me that water is everywhere. I groan, walk over to check it out, and immediately see that the situation is now five times worse than it was before. The “nice spray” is now Old Faithful, and I have full-blown flooding behind the bar that’s also seeping onto the carpet in the bar area. Fabulous. Unfortunately the only credit card machine for the dining room is located behind the bar, and I had two cards to swipe. So I decide to take a half-shower on the lower part of my body, process the payments and then call the Engineering Department again. I think they’re going to stop answering my calls soon. The problem was fixed by turning the water off and placing a maintenance call to Coca-Cola. They’ll be out to fix things on Monday, but the carpet’s another story. Just another day!